Prescription drugs, over-the-counter medications, and dietary supplements all present some level of risk. Most concerning of these risks is the potential for damage to vital organs. Professional and governmental organizations recently collaborated to publish LiverTox, an online resource for medical professionals that provides a list of the riskiest medications along with continually updated information.1 In addition, practitioners can use this DNI (drug-nutrient interaction) checker to view potential drug and nutrient interactions that could affect their recommendations. Learn more about the dosing and lesser-known benefits of CoQ10. 2. Jaeschke H, Gores GJ, Cederbaum AI, Hinson JA, Pessayre D, Lemasters JJ. Mechanisms of hepatotoxicity. Toxicol Sci. 2002;65(2):166-176. 3. Pessayre D, Fromenty B, Berson A, et al. Central role of mitochondria in ... Drug Metab Rev. 2012;44(1):34-87. 4. Varga ZV, Ferdinandy P, Liaudet L, Pacher P. Drug-induced mitochondrial dysfunction and ... Am J Physiol Heart Circ Physiol. 2015;309(9):H1453-67. 5. Peres LA, da Cunha AD. J Bras Nefrol. 2013;35(4):332-340. 6. Aberg F, Appelkvist EL, Dallner G, Ernster L. Distribution and redox state of ubiquinones in rat and human tissues. Arch Biochem Biophys. 1992;295(2):230-234. 7. Crane FL. Biochemical functions of coenzyme Q10. J Am Coll Nutr. 2001;20(6):591-598. 8. Jiménez-Santos MA, Juárez-Rojop IE, Tovilla-Zárate CA, et al. 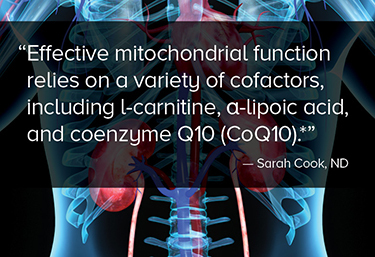 Coenzyme Q10 supplementation improves metabolic parameters, liver function and mitochondrial respiration in rats with high doses of atorvastatin and a cholesterol-rich diet. Lipids Health Dis. 2014;1322. 9. Pek SL, Tavintharan S, Woon K, et al. MicroRNAs as biomarkers of hepatotoxicity in a randomized placebo-controlled study of simvastatin and ubiquinol supplementation. Exp Biol Med (Maywood). 2016;241(3):317-330. 10. Yeung CK, Billings FT, Claessens AJ, et al. Coenzyme Q10 dose-escalation study in hemodialysis patients: safety, tolerability, and effect on oxidative stress. BMC Nephrol. 2015;16183. 11. Flowers N, Hartley L, Todkill D, Stranges S, Rees K. Co-enzyme Q10 supplementation for the primary prevention of cardiovascular disease. Cochrane Database Syst Rev. 2014;12CD010405. 12. Pagano G, Aiello Talamanca A, Castello G, et al. Current experience in testing mitochondrial nutrients in disorders featuring oxidative stress and mitochondrial dysfunction: rational design of chemoprevention trials. Int J Mol Sci. 2014;15(11):20169-20208.